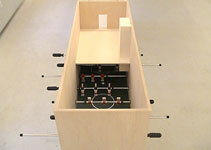 The starting-point of the project modell Q is a real space: the Wacker Gallery. The space itself not only serves as material for the artist but is also incorporated into the installation as a model for the subject matter. model Q allows us to transcend the pragmatic boundaries of space as well as to materialise visions which lie beyond whats practically feasible. 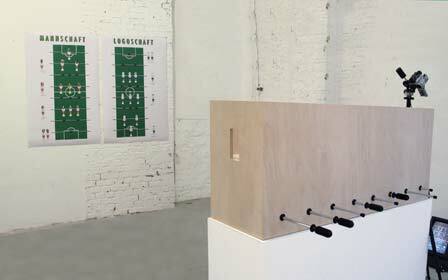 "une méthode de voir l'avenir", my contribution to model Q, seeks to transform the entire gallery space into a table football field. 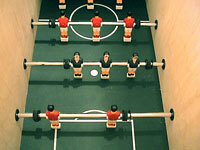 In the lower area, two teams of nine players each play against each other: the "human team", made up of contemporary public personalities, competes against the "logo team", comprising nine logos embodying concepts, ideologies and symbols. 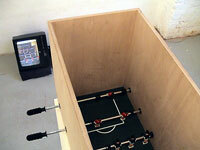 The lifesize figures are actually playable from the outside (unfortunately without intervisibility between the players, but at least with an acoustic connection via walkie-talkie to the audience in the gallery). Only the spectator gallery is accessible from the gallery space: the game's progress is captured by three video cameras and screened on the wall opposite; the passing of the ball symbolises "une méthode de voir l'avenir".